Designed by Gilbert Scott, St Pancras Station in London, is 243 feet wide and 600 feet long. 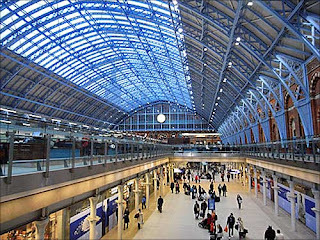 St Pancras International Railway Station is home to the Eurostar for services to Brussels and Paris. The station has Europe's longest champagne bar, shops, restaurants and cafes. One of the greatest Victorian buildings in London, the station also offers a great shopping experience. It is also a perfect place for filming, photography and h The St Pancras Renaissance Hotel is hailed as London's most romantic building. The glorious Gothic Revival metalwork, gold leaf ceilings, hand-stencilled wall designs and grand staircase are amazing. It was designed by Sir George Gilbert Scott to receive travellers.